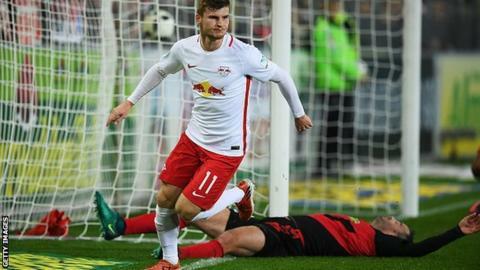 RB Leipzig extended their lead at the top of the Bundesliga table to six points with an easy win at Freiburg. Guinea midfielder Naby Keita had opened the scoring for Leipzig only for Florian Niederlechner to equalise. Germany Under-21 striker Timo Werner scored two goals in the space of 14 first-half minutes as the visitors established a 3-1 interval lead. Austria's Marcel Sabitzer completed the scoring for Leipzig, who have won four promotions in seven seasons. RB Leipzig were only founded in 2009 and, with the backing of Red Bull, are in the German top flight for the first time. Champions Bayern Munich can cut Leipzig's lead to three points if they win at home to Bayer Leverkusen on Saturday (17:30 GMT). Match ends, Sport-Club Freiburg 1, RB Leipzig 4. Second Half ends, Sport-Club Freiburg 1, RB Leipzig 4. Substitution, RB Leipzig. Rani Khedira replaces Marcel Sabitzer. Attempt saved. Emil Forsberg (RB Leipzig) right footed shot from the left side of the box is saved in the centre of the goal. Assisted by Diego Demme. Attempt missed. Naby Keita (RB Leipzig) right footed shot from a difficult angle and long range on the right misses to the right. Assisted by Marcel Sabitzer. Goal! Sport-Club Freiburg 1, RB Leipzig 4. Marcel Sabitzer (RB Leipzig) right footed shot from the right side of the box to the bottom right corner. Assisted by Emil Forsberg following a fast break. Substitution, RB Leipzig. Oliver Burke replaces Yussuf Poulsen. Substitution, Sport-Club Freiburg. Mats Møller Dæhli replaces Nils Petersen. Offside, RB Leipzig. Naby Keita tries a through ball, but Timo Werner is caught offside. Marcel Sabitzer (RB Leipzig) hits the left post with a left footed shot from the left side of the six yard box. Assisted by Emil Forsberg with a through ball. Foul by Naby Keita (RB Leipzig). Substitution, Sport-Club Freiburg. Jonas Föhrenbach replaces Manuel Gulde. Offside, RB Leipzig. Emil Forsberg tries a through ball, but Timo Werner is caught offside. Attempt saved. Vincenzo Grifo (Sport-Club Freiburg) right footed shot from outside the box is saved in the bottom left corner. Assisted by Christian Günter. Foul by Benno Schmitz (RB Leipzig). Attempt missed. Marcel Sabitzer (RB Leipzig) left footed shot from outside the box is too high. Assisted by Emil Forsberg following a fast break. Offside, RB Leipzig. Stefan Ilsanker tries a through ball, but Timo Werner is caught offside. Attempt saved. Stefan Ilsanker (RB Leipzig) header from the centre of the box is saved in the bottom left corner. Assisted by Emil Forsberg. Attempt missed. Emil Forsberg (RB Leipzig) right footed shot from the left side of the box is high and wide to the right. Assisted by Timo Werner following a fast break. Nicolas Höfler (Sport-Club Freiburg) hits the bar with a right footed shot from the right side of the six yard box following a corner. Attempt blocked. Manuel Gulde (Sport-Club Freiburg) header from the centre of the box is blocked. Assisted by Vincenzo Grifo with a cross. Corner, Sport-Club Freiburg. Conceded by Willi Orban.